Beautiful limited edition New Zealand picture Postcards that commemorate Peter Jackson’s award winning ‘The Lord of the Rings: The Two Towers’ movie. Inspired by J.R.R. Tolkien’s ‘The Lord of the Rings’ trilogy, these maximum cards pay tribute to and explore his immortal Middle Earth saga in a manner that film enthusiasts, stamp collectors, and fans will enjoy. THIS LIMITED SET of six Maximum Postcards featuring key characters and scenes from ‘Two Towers’ movie, with related gummed stamps and first day (Dec 4, 2002) cancellation postmark. Now out of print (OOP), these Official Postcards were only sold in New Zealand. Postcards size: 4.13 H x 5.7 W inches; 105 x 145 mm. Issue date: 4 December 2002. Postcards - 40 cent: Aragorn (Viggo Mortensen) at Helm’s Deep, 80 cent: Legolas (Orlando Bloom) fighting, 90 cent: Saruman (Christopher Lee) and Gríma Wormtongue (Brad Dourif), $1.30: Gandalf the White, $1.50: Frodo (Elijah Woods) and‘Sam’Gamgee (Sean Astin), $2.00: King Théoden (Bernard Hill) at Helm’s Deep. 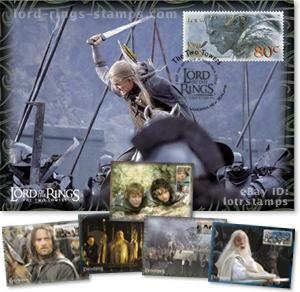 Maxi cards and stamps were designed by Sacha Lees at Peter Jackson’s WETA Workshop in Miramar. Set comes in a clear, archival-quality protective sleeve, and includes collectible NZ Post pamphlet containing extensive background information on both this exciting stamp release and the epic production it honours. An earlier now OOP ‘The Fellowship of the Ring’ set was issued in December 2001 and a third ‘The Return of the King’ set was released in November 2003 to commemorate the ‘Middle earth’ movie trilogy. Contact us for price and availability or check our regular auctions.